Elaine G. McGillicuddy is a former nun who married a resigned priest. In this book she tells her deeply romantic and beautiful story of how the two of them met and how the love that developed between them was so life-giving they could not dismiss it as incompatible with their religious vocations. They rather found in each other the fulfillment and the enrichment which was the goal of their religious vocations. Her book tells the story of their journey and their struggles to honor both their vows and their love. It reads with a penetrating integrity. Readers interested in the effects of Vatican Council II from the inside out will benefit considerably from reading Elaine’s memoir of her life with priest Francis McGillicuddy. Those who, like me, wonder—or worry— about how they will survive the death of a beloved spouse will be galvanized by it. Author of Sister Trouble: The Vatican, the Bishops, and the Nuns. To be heard is one of the deep longings of our hearts, along with being seen. Francis became a priest and Elaine a nun because they heard and saw more than many others..The story of their discovery of one another, of forbidden love’s blossoming and the challenges they faced together from life, their Church and death — is a story of courage and passion, vulnerability and integrity well told by the woman who lived and lives it. McGillicuddy’s book is a deeply affecting chronicle of a love affair of over forty years and a marriage nearly that long. It moves from keen soul-searching and theological exploration to profound and enduring love, indeed a love that eventually takes Elaine and Francis through the care-taking hell-fires of cancer, excruciating pain, fear and death. This memoir gives the world a unique model of marriage as a growing sacrament that is both a miracle and a gift of immeasurable value. Elaine McGillicuddy’s intimate memoir of love in her many-faceted relationship with Francis, has a compelling personal quality in detail and feeling which ranks it high in its type of literature. In the last section, they manifest a moving and realistic love during Francis’s struggle with cancer, an inspiring way for us to live and die. I finished your book last night and wanted to tell you how much it moved me–from the beginning intimations of love to Francis’ last smile. You captured in words and photos an earthly love that’s as rare as it is beautiful (and I use present tense, because I know this love is still there for you and Francis). You did a masterful job finding the thread that pulls 40 years worth of events into a coherent story, a highly readable form. Having just finished reading your memoir, I want you to know how moved I was by it. The tender details of your relationship, and of Francis’ illness brought tears, but also amazement that you were willing to share so much that was very personal. Francis’ real presence is there in the reading. I can only describe it as a grace-filled experience, and a gift to those who will be exposed to such a deep and blessed love. I find your book remarkable in numerous ways….your fine writing, your attention to details, your many stories, and the love between you and Francis that comes across so eloquently. I found it hard to put down. I also enjoyed seeing the pictures throughout the book which certainly added to the overall effect. A part that moved me deeply were the comments at the end that others had written about how Francis touched their lives. What speaks to me about the story of you and Francis is, the desire that, I think, lived in both of you to love and be loved in a sacred manner – nearly worship – but not of each other – but of the divine that lives within you both. I love that, and feel that the essence of loving another is perfectly expressed in your story. I have to say, I put off reading the very ending of your book, about Francis passing, until just a few days ago – and it was such a loving account of death. I feel there is a great gift in the sharing of what Francis was thinking about, and the different emotions he went through. It is such a dark, mysterious experience, and to read your account, I was left with the feeling that we are meant to die, in the same way that we are built to give birth, or breathe, or do any other natural process. It is certainly in its own class of experience, but, it seemed natural, as you wrote about it. I had anticipated to be scared of it, but instead, I was fascinated, nearly enthralled with the magnificence of it. I felt like we are guided in death by the great spirit, and that it cannot be as scary as it seems, if you trust the process – like Francis said “Let go and let God.” What an amazing feat – that he accomplished that, and was able to share the experience through you. Letter from my former doctor, Daniel C. Bryant M.D. Elaine -This is some book! I must admit I was a little leery when I started it, thinking there would be more about religion and spirituality than I, a superficially, at least, a-religious person, would like. But, though there is a lot of that, together with a lot of specifically Catholic concepts, the power of the story drew me on. First of all, though maybe the least important, the writing is wonderfully clear, even at times lyrical and humorous. No doubt your journalism experience contributed to the high level of your prose, but also your wide reading, including of poetry. Most impressive about the book, though, is the honesty, both between you and the reader, and you and Francis (what an appropriate name Frank is). Unflinchingly, you speak of deeply personal issues that often are skipped over, even in fiction. The whole celibacy dilemma is so openly presented, and serves as such a great metaphor for the many conflicts between intellectual conviction and human urges that trouble us all. Then there was the agonizing over children, and all the discussion related to illness and end of life concerns. The references to political issues and their moral relevance were worked in nicely, too. Your—both of your—positions and activism regarding Vietnam, the Cold War, nuclear weapons, tax protest, were obviously some of the factors that bound the two of you together on the intellectual level. Add in yoga and music and a bit of cooking, and the two of you were a perfect match indeed. One thing about the book I enjoyed on a personal level was the references to specific dates, places, and people. . . Friendship does emerge as one of the major themes of the book, if not one of the major “faiths” of our lives. Finally, that last section when Francis is dying, and your conversations are recorded, is not only moving, but invaluable. Nowhere else, in any of the “death and dying” books and conferences, have I seen such documentation of the final stages, the final farewells, of a long, close relationship. That last section should be required reading for medical students and chaplains, if not for everybody. * When I read the incident of massaging Francis’ feet, I thought not only of Jesus washing feet, but the episode in Tolstoy’s Death of Ivan Ilyich when the servant massages poor, lonely Ilyich’s feet, giving him the human contact that he so needed but that neither his family or the doctors ever gave him. Lots more could be said about your book, Elaine, but it can be easily summarized: terrific. By autumn of 2015, what Dr. Bryant proposed in his response above, has begun to happen. When my neighbor heard about it, he volunteered to put me in touch with a friend of his, a doctor of medicine who teaches at a New England university of medicine. That doctor agreed, so I mailed him copies of my three books. I was, and still am, deeply grateful to know that those remarkable conversations between Francis and me, only days before he died, will be shared with medical students. The last chapter in my book SING TO ME . . . A Love Story . . . which is entitled “Last Suppers,” consists of verbatim transcriptions of Francis’ and my last four conversations. After the first conversation was shared through email with family and friends, it was Francis’ own Endocrinologist, Dr. John Devlin, who brought us his small recorder, to use. It turned out there were four more conversations. It took me three years to summon the courage to listen to and to transcribe them. Because they were verbatim transcriptions, Francis’ words sound like him. I told my editor and publisher, that even while proofreading this chapter in preparation for publication, I felt I was treading holy ground. And for me, that impression still holds. “Sing to Me and I Will Hear You: A Love Story” by Elaine G. McGillicuddy. Caritas Communications, Thiensville, Wisc. 269 Pages. Maine author Elaine McGillicuddy’s memoir is subtitled “A Love Story,” and that description is certainly true. But anyone who expects saccharine will be disabused of that idea quickly. This is a highly candid (and well written) account of a spiritual journey, experienced through the unusual marriage of a former Roman Catholic nun and a former priest. A Catholic reader will doubtless draw some special insights from it, but anyone can be moved by this story of spiritual growth, with its setbacks, victories, and inevitable tragedies. It’s intensely personal; because of that, and for convenience, I’ll refer to the couple by their first names, Elaine and Francis. This is also the story of two people willing to take risks and engage not only in their own marriage, but in the host of human relationships envisioned in the instruction to “love one another.” And it is, as one might guess, a story informed by the deep faith of both participants. The book is written in three parts. The first is the “underground” romance of then-Ursuline Sister Maureen, 33, and Father Francis McGillicuddy, 41. This was the Vietnam era, when the Catholic church was also in ferment, and young priests and nuns could envision a “third-way” of platonic friendship infused by deep spiritual understanding. Elaine titles her first chapter “Through the Third-Way,” because she and Francis passed “through” it en route to an “underground marriage,” not celibate, and eventually to marriage in the church after the requisite permission for Francis to leave the clerical priesthood. (Elaine had already left her vocation.) They settled in Portland, Maine, where Elaine still lives. The book’s second part is their life together, with all its joys and difficulties, including a failed effort at adoption. They had no children of their own. And here I think I should say that little in my experience prepared me for this book. My life—except for travel and and its own love story of a long marriage—includes nothing like Elaine’s and Francis’s involvement in community work, “peace dances,” the Catholic peace movement, sustainable living (“permaculture”), running a yoga studio, and yet . . . . Elaine writes so winningly about all these that I’ve had to suspend a certain resistance and read the book for what it is—a unique life journey, eloquently described. What makes it easier to do this, for me at least, is the book’s third section, a poignant account of Francis’s illness and death from bone cancer, while tended at home by Elaine, friends, and hospice workers. The physical detail is painful, the spiritual power uplifting. Francis’s peaceful death, at 82, and the days afterward is a true celebration of life. It is a vision “through death” to what comes next. This story of his illness itself can be harrowing to read, and has to be. There is no easy way. I am roughly Elaine’s age and each week seems to bring losses. A friend is going through an experience much like Elaine’s, caring at home for a beloved wife he may soon lose. He is a man of deep faith and human sympathies, as well as great fortitude. But also of misgivings and frailties. He is suffering, but also being supported by friends and family. For anyone who wants to know more about the full range of such a true “love story,” this book is highly recommended. 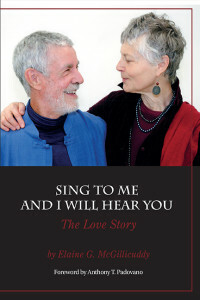 (REAL NAME)This review is for: Sing to Me and I Will Hear You – A Love Story (Kindle Edition)I met the McGillicuddy’s several times over the years, and so when I saw this book in a shop window, I had to read it to see how their story was turning out. A former nun married to a resigned priest, I also wondered about the beginnings of their love, and their view of the marriage journey. I’ve been married 30 years now, we’re not religious at all (Buddhist/Quaker mixed with non-believer tendencies) and Elaine’s story renewed my sense of my own marriage and life journey. Although this story ends with Francis’ death, and how Elaine coped with the “midwifery” process of handing over her husband to the inevitable process of dying, this is a story that is not heavy with religious dogma, but goes deeper into the honest experience of love, and hopefulness and happiness in spite of the fact that life comes with death.As women all around me are becoming widows, it can be so scary, being middle aged and watching my older husband starting to show signs of being a mere mortal after all. I devoured this book for courage and inspiration in celebrating all parts of a life well-lived. We enjoyed the early chapters, describing how Francis and Elaine made their lives, their work and recreation, and most importantly, their supportive friends. I never get the sense that they “go it alone,” but along the way they are nourished by many fine Mainers who I have also known over the years. It is fun to recognize the people and places of the McGillicuddy’s journey, but even if you never lived in Maine, the process of letting go of a husband and entering widowhood with courage and faith puts important perspective on the marriage journey. I don’t know which of us will go first, but as “til death do us part” is unavoidable, I am inspired to follow the McGillicuddy’s example of fearlessness in love.